Helen M. Lenhardt, better known as Marie (Shugarts) Lenhardt, died on Saturday, May 5, 2018. She was 92. Marie was a long time resident of Hatboro, living at 53 Rorer Aveune since 1953. She was active in church service at Lehman United Methodist, where she was a member for 67 years, and enjoyied many years singing in the church choir. Marie was employed in the school district of Hatboro-Horsham as a secretary prior to retirement in 1987. She is survived by her daughter, Anne M. McCann; her two grandchildren, Marta and Charles; one great grandchild Willow; and her two sisters, Linda Reale and Margaret Hutchison. She was pre-deceased by her three husbands, Robert C. Riehl, Eugene A. Murray and John Lenhardt and her brother Edmund B. “Jack” Shugarts. For many years, she acted as the family historian for her father’s family line, Shurgarts and was a descendant of Heinrich Johann Schuckert of Eckhartshausen, Germany. 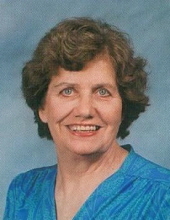 Marie was a dedicated Christian who served as a lay minister at Lehman Church and in the community. She loved people and quietly sought to serve others. She loved teaching Sunday school at Lehman. Her family will receive relatives and friends after 10 am, Friday May 11 in Lehman United Methodist Church, 300 S. York Rd, Hatboro, where her funeral service will be held at 11 am. Her interment will follow in Sunset Memorial Cemetery. To send flowers or a remembrance gift to the family of Helen Marie Lenhardt, please visit our Tribute Store. "Email Address" would like to share the life celebration of Helen Marie Lenhardt. Click on the "link" to go to share a favorite memory or leave a condolence message for the family.